I mentioned it in a previous post, but I just have to shout it again. I’M DONE! I finally finished my Christmas wreath last weekend and I’m so excited! I have been getting so many wonderfully encouraging comments about this project, I just can’t wait to share. 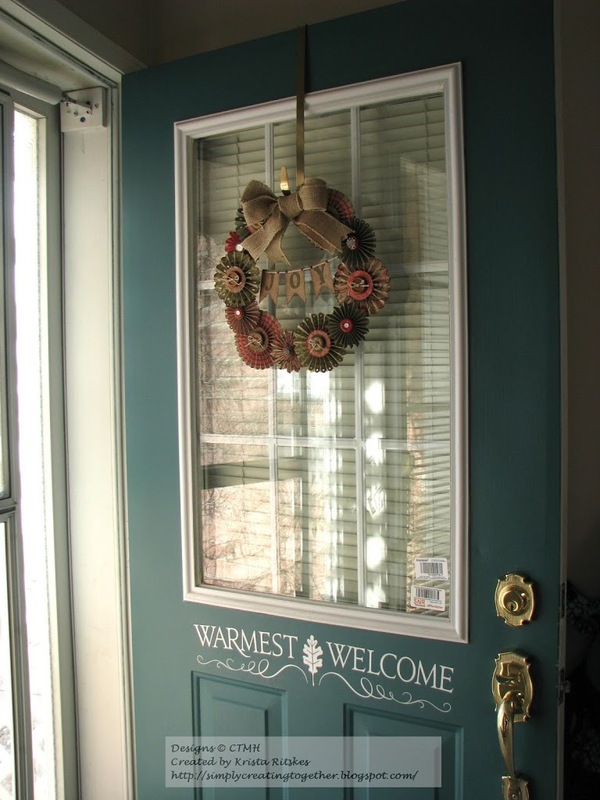 I hung it up on my door and took some photos on our beautiful sunny winter afternoon … and then just left it up. Hee hee. 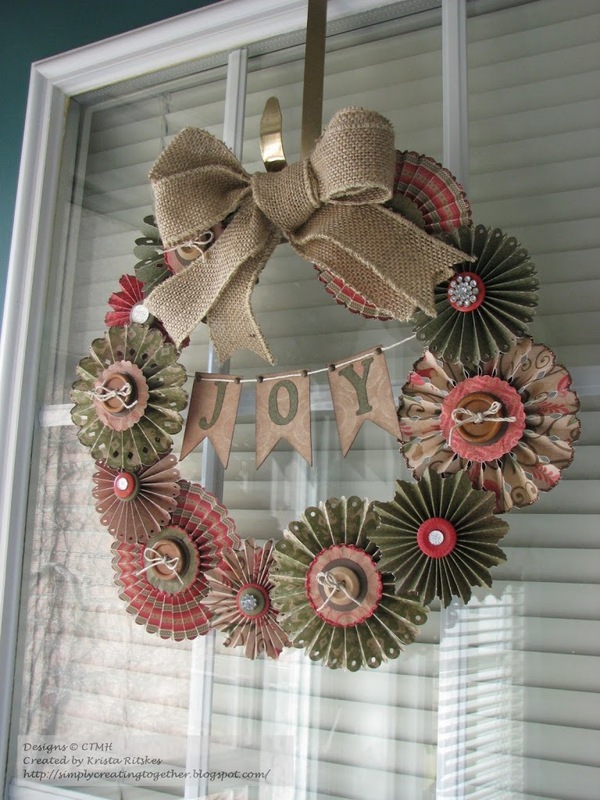 Yes, Christmas is over and most of our decorations are put away, but my wreath is beginning its display time. 🙂 Here is a photo of what it looks like on our door. Here’s a better view of the wreath. Do you recognize some of those medallions (or yo-yos as some people call them)? I posted the beginning of this project last month. You can see that post here. Here are a couple close ups. 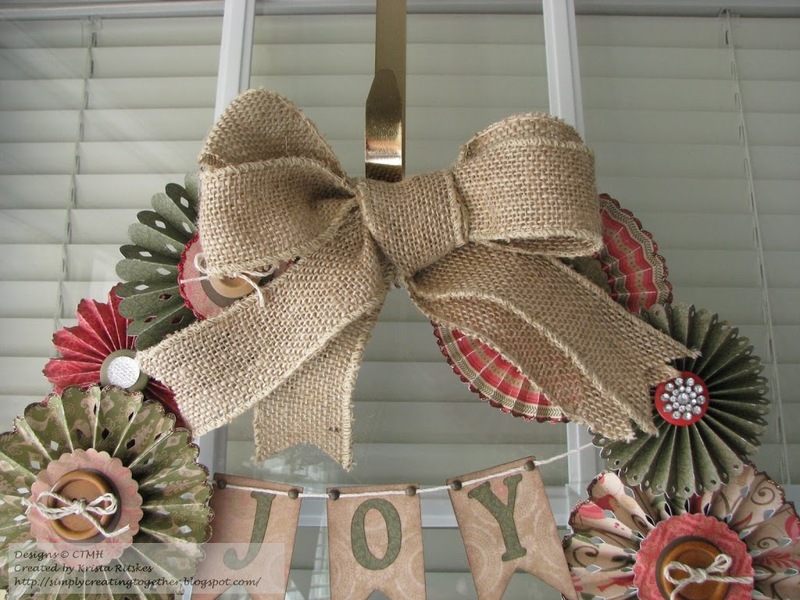 If you know me, you know that the burlap ribbon was my favourite new product in the Autumn/Winter Idea Book. I just doubled it up before tying the bow, made it much fuller and more pretty. 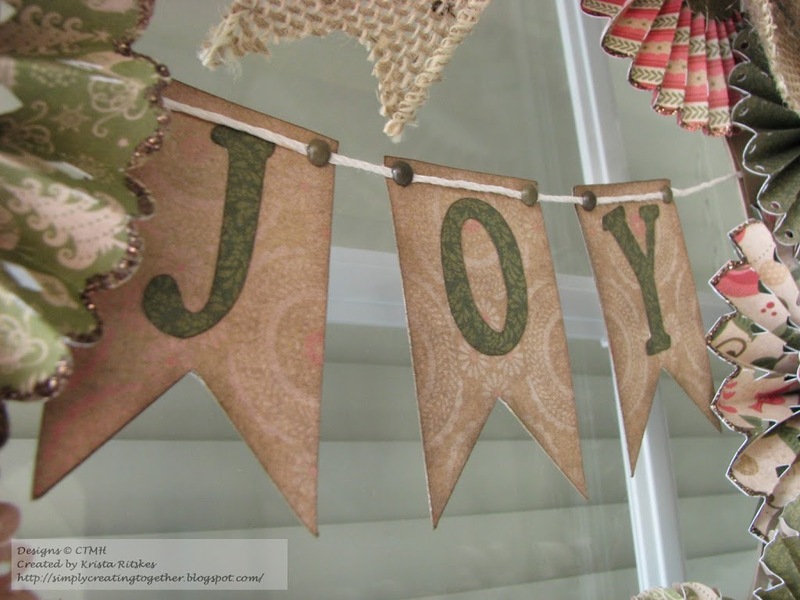 This banner was cut with Art Philosophy, twice (once in patterned paper and once in Cocoa) to make it sturdier. The letters were also cut on the Cricut, but I can’t remember which cartridge, I looked at quite a few of other people’s before deciding on these. I used Cocoa brads to anchor the white hemp and then glued it to the base. The base! I need to tell you what I used. When consultants order bulk paper, there’s a sheet of cardboard in the package. I used two of them, cut the circle shape out, and glued them together with Liquid Glass. I’m sure you’re not really supposed to see the hook when you hang a wreath on one of these hangers, but that’s the way it turned out for me. I used a piece of burlap, stuck to a piece of leftover cardboard with brads and then Liquid Glassed to the back to create a spot for the hook. The medallions, if you remember, were all cut on the Artiste cartridge. I have only used Pear & Partridge paper along with a bit of Cocoa cardstock. I added some Glitz Gel to some of them, either Bronze or Red, along with Wooden buttons and other bling from various Close To My Heart packages. I absolutely love it! And I’m so happy to finally have some papercrafting goodness gracing our front door. Thanks for dropping in. Happy Creating!